Christmas cards to support Astusjodur are sold at Bóksala Stúdenta at Háskólatorg. The cards are size A5, folded (double) with envelopes. Welcome for just 3 900 ISK per ticket. Astusjodur will continue to support the rescue teams to improve their methods for searching for people in difficult areas. In collaboration with the resue teams further equipment have been ordered. The people behind Astusjodur are glad to see how interested the resque teams are in this project. 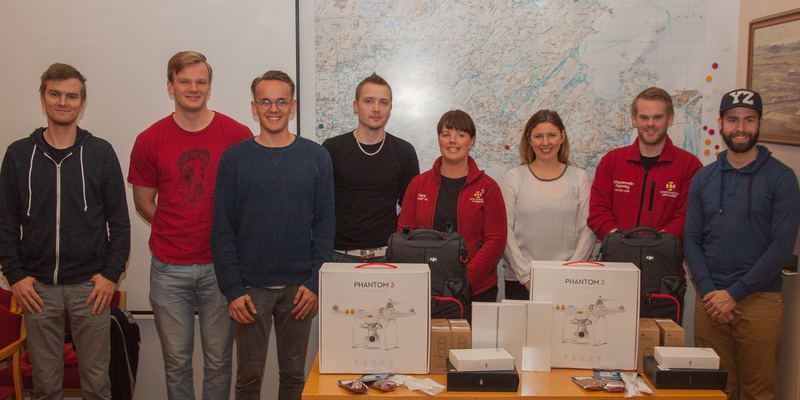 In December 2014 Astusjodur delivered four search drones to the rescue teams at Hvolsvöllur and Hella in South Iceland. Including two cameras and two infrared cameras to bee attached to the drones. These are the first drones used by a rescue team in Iceland. The teams hope the drones will be of great help in searching for missing people in difficult areas. Greeting cards and christmas cards to support Astusjodur have been available since December 2014. The cards are size A5, folded (double) with envelopes. To order cards please send an email to kort@astusjodur.is Here you can see the pictures of the cards. A fundraising concert for Astusjodur took place in Austurbær at Snorrabraut, Reykjavík on Tuesday night November 25th 2014. The bands Árstíðir and Byzantine Silhouette and the musicians Megas and Magga Stína, Ragga Gröndal and Svavar Knútur performed for a full concert hall of enchanted audience. Among companies supporting the Concert were: Hótel Hvolsvöllur, Stracta Hótel, Hótel Rangá, Hellishólar, Prentlausnir, Kaffifélagið, Reykjavík Roasters, Optical store Sjáðu, 12 tónar, Sólon, Gray Line and Kökugerð HP. Drones have been ordered for the search and rescue teams at Hvolsvollur and Hella, southern Iceland. The drones and technical equipment have been chosen in collaboration with the teams. The drones are expected to be of great help in searching for missing people in difficult areas. Improved knowledge and techniques for search in the difficult situations often encountered in Iceland is a main interest of Astusjodur. The drones will be delivered to the search and rescue teams as soon as they arrive in Iceland. A group of brave women and men ran in support of Astusjodur in the 2014 Reykjavík Marathon. Many thanks to the runners and those who donated to support them. Acquiring drones for Rescue Teams to ease searching for people from the air. Drones can be very valuable in search and rescue operations under the difficult circumstances often encountered in Iceland. Concert in support of Astusjodur in November 2014. Greeting cards and Christmas cards in the name of Astusjodur. Astusjodur can already be supported by sending condolence cards. Measures to prevent accidents in nature. Discussions during the winter 2014-2015. Symposium on important legal issues. Winter 2014-2015.